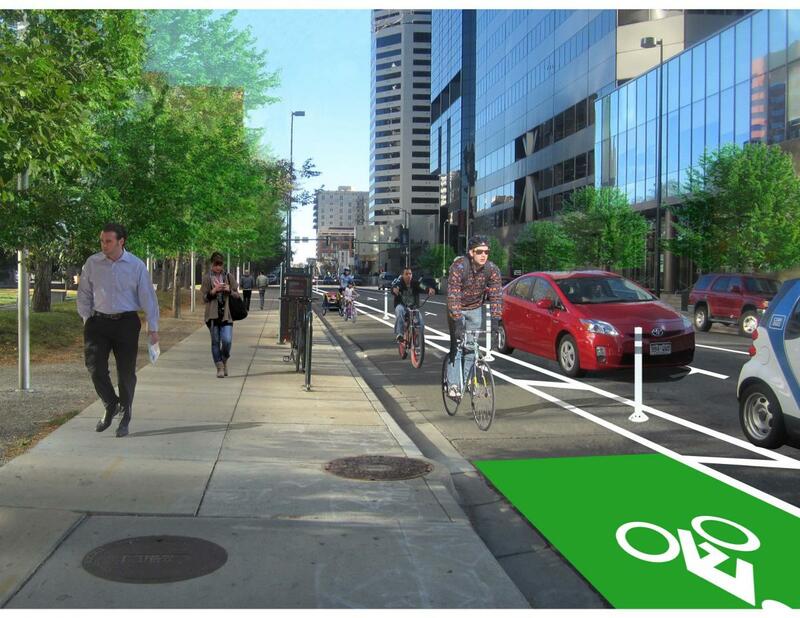 Designing a network of enhanced bikeways for everyone in Downtown Denver. The City & County of Denver, in partnership with the Downtown Denver Partnership, is currently designing a network of enhanced bikeways centered in Downtown Denver and radiating throughout the City. The next step in implementing the enhanced bikeways - more commonly known as protected bike lanes - will be to take the Plan's recommended facilities to full design before construction can begin. To speed up the implementation process for Downtown, the Partnership is leading an effort to fund the full design of the Arapahoe Street corridor in Downtown. The Partnership is hoping to raise at least $35,000 from the community to match the $120,000 already committed by the Gates Family Foundation and the Downtown Denver Business Improvement District. The more money raised by this effort means that the Partnership can fund a more complex design for bicycle facilities in Downtown Denver. The Arapahoe Street corridor was selected after a dedicated planning process with input from the public and fulfills the City's needs to enhance the network of protected facilities in Downtown Denver. Once the corridor has been fully designed, the City & County of Denver will begin the process of scheduling the completion of the corridor into their annual work plan and/or identify other funding sources to complete the corridor. This project closely correlates to the City’s participation in the Green Lane Project, a national effort to build out more protected bike lanes in cities across the United States. The Downtown Denver Partnership will work with the City & County of Denver to hire a traffic engineering firm to complete traffic engineering plans for a protected bike lane on Arapahoe Street in Downtown Denver. After the traffic engineering plans are complete, the City & County of Denver will begin scheduling the construction of the bicycle facility along this corridor. Complete construction of this facility is expected by 2016. It is estimated that approximately 60% of the general population identifies themselves as an “interested, but concerned” bicyclist, meaning that they want to bicycle but are concerned about how safe it is to ride on the street, in traffic with cars. To encourage this population to try bicycling, it is critical to provide enhanced bikeways. The Downtown Denver Partnership, as noted in the 2007 Downtown Area Plan, aims to create a more bicycle friendly downtown that caters to all types of users from the most advanced and confident riders to those who want to ride but do not have the skills, experience or confidence to ride in more urban environments. Arapahoe Street Protected Bike Lane rendering is provided through an in-kind donation by Alta Planning. We received a lot of great media attention earlier this week when we launched our campaign! Read some of the stories and watch the videos by checking out the links below. Look for some additional media to come out in a few weeks. Thank you to our early donors! Your support is greatly appreciated. Make sure to use the hashtag #DenverPBL when talking about this campaign on social media. East West Partners - Denver, Inc.